Construction has an infamous gender imbalance which the industry needs to redress. Working with young women can help tackle false perceptions of the industry and promote construction careers. The site supported the local council’s Women in Engineering and STEM event for secondary school aged females. The site team delivered a workshop to 80 year 8 girls from the area, carrying out four workshops with 20 girls in each group lasting 45 minutes. 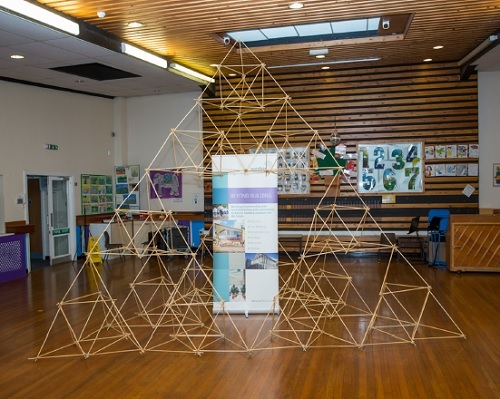 As part of the challenge, the girls were tasked with building a giant tetrahedron from sticks and elastic bands with the assistance of the site team. The girls had to plan the quantity of straws and materials needed to complete the task, working within a set budget, and then collect the right materials to follow the construction instructions. Participants submitted the costs for the construction of their tetrahedron and “cost damages/ penalties” increases for late purchase of sticks and rubber bands. These materials were used by teams of 20 to build the tetrahedron within the time period. The final task is to connect all the 4 groups’ tetrahedrons together to form a giant one. This project provided the students with an insight into budgets, planning, programming, physical works, quality control and teamwork, showing the variety of careers and excitement of the construction industry. Monitor report. Wates Construction. County Durham. June 2018.